Leland Stanford "Larry" MacPhail, Sr. (February 3, 1890 – October 1, 1975) was an American lawyer and an executive in Major League Baseball. He served as an executive with several professional baseball teams, including the Cincinnati Reds, Brooklyn Dodgers and New York Yankees. MacPhail's sons and grandsons were also sports executives. He was inducted into the National Baseball Hall of Fame in 1978. During World War I, he served as an artillery captain in France and Belgium. He accompanied his commander, Colonel Luke Lea, on an unsanctioned mission to Amerongen in the Netherlands in January 1919 to attempt to arrest the exiled German Kaiser, Wilhelm II, and bring him to the Paris Peace Conference to be tried for war crimes. MacPhail reportedly stole an ashtray that belonged to the Kaiser and received an official reprimand for the mission. After his discharge from military service, MacPhail opened a law office in Columbus, Ohio, where he eventually purchased an interest in the Columbus Red Birds, a minor league affiliate of the St. Louis Cardinals. While in the role of president of the Red Birds, MacPhail came up with a plan to create a geographically based playoff system for determining the league champion of the American Association. It was not well-received and lasted only two years. In 1933 he was hired by the Cincinnati Reds and became its chief executive and general manager. MacPhail had been recommended for the Reds position by Branch Rickey, who said that MacPhail was "a wild man at times, but he'll do the job." After leaving the Reds, he spent about a year with his father's investment business before becoming executive vice-president and general manager of the Brooklyn Dodgers in 1938. He was promoted to team president, a position that had been vacant for about a year after the death of the previous team president Stephen McKeever, on May 4, 1939. In 1939, he received the Sporting News Executive of the Year Award. MacPhail owned a 400-acre (1.6 km2) farm near Bel Air, Maryland called Glenangus. An owner/breeder of Thoroughbred racehorses, his colt General Staff won the 1952 Narragansett Special at Narragansett Park and five other stake races that year. 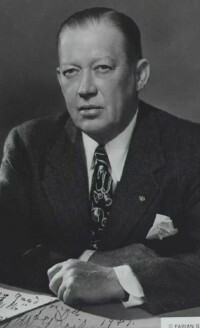 In March 1952, MacPhail was appointed President of Bowie Race Track in Bowie, Maryland. He held the position for thirteen months, until he was removed from the position and barred entirely from the track; he was accused of "using profanity to three horse owners" and "charged with being drunk and disorderly." Several of MacPhail's family members have become sports executives. His son (and namesake) Lee MacPhail enjoyed a long career in baseball, most notably as president and general manager of the Baltimore Orioles, general manager of the Yankees, and president of the American League. He was elected to the Baseball Hall of Fame in 1998, making him and Larry MacPhail the only father and son inductees. His other son Bill MacPhail was president of CBS Sports and later was President of CNN Sports, brought on by Reese Schonfeld to create the department upon the network's launch. Larry's grandson Andy MacPhail, the former general manager of the Minnesota Twins and Chicago Cubs and the former president of baseball operations for the Orioles, became president of the Philadelphia Phillies at the close of the 2015 season. A great-grandson, Lee MacPhail IV, is a professional scout for the New York Mets. Another, Drew MacPhail, is a member of the Los Angeles Dodgers' front office. ^ "The bizarre tale of a kidnapping attempt, the German kaiser and a beloved ashtray". Washington Post. 2018-08-14. ^ a b c "Larry MacPhail, baseball impresario, dies". Daytona Beach Morning Journal. October 2, 1975. Retrieved November 29, 2014. ^ "M'Phail is Advanced - Named President of Dodgers and Given Extension of Contract". New York Times. May 5, 1939. p. 30. Retrieved 4 September 2016. ^ Walker, Childs. "Lee MacPhail, Hall-of-Fame baseball executive with Orioles and others, dies at 95," The Baltimore Sun, Friday, November 9, 2012. ^ a b c "Larry MacPhail was wacky genius," The Washington Times, Monday, June 25, 2007. ^ Kahn, Roger (1993) The Era, 1947–1957: When the Yankees, the Giants, and the Dodgers Ruled the World. New York: Ticknor and Fields, pages 141-147. ^ "M'Phail Still Barred". New York Times. April 24, 1953. Retrieved 24 April 2017. ^ Chass, Murray (March 4, 1998). "Baseball - Doby Again Follows Robinson". New York Times. Retrieved 4 September 2016. ^ "Larry MacPhail Award". MiLB.com. Retrieved February 23, 2016.